There’s a famous quote, usually attributed to Mark Twain – “Find a job you enjoy doing, and you’ll never have to work a day in your life”. It’s definitely a romantic way to think about one’s profession. There’s no doubt that people who genuinely look forward to going to work and embracing the day’s challenges are happier, more fulfilled, and more successful in terms of their career paths. Unfortunately the reality is that very few people are fortunate enough to derive income from doing something they’re passionate about. Even those that say they love their jobs don’t love them every day. If you feel like you’re in a rut with your career, it’s something to think about. Even more so if you’ve ever thought about running a restaurant, daydreamed about dropping out (of study or work) to write your first novel or screenplay, or anything along those lines. The lucky few who do love their jobs usually do so because they’ve made a living out of something they already love – rather than trying to love what they happen to be doing. Sounds like a pretty simple approach, right? So why do so many people stay where they are? Well, sometimes it takes a bit of creativity to turn your passion into a job or a business. It’s easy to see how a love for good food and hospitality could translate to opening a restaurant. But the writing thing could be a challenge if you’ve never drafted much more than a shopping list. Not everyone’s cut out to be the next Pulitzer Prize winner. What you can do is look for ways to apply your current skill set in the industry or vocation of your choice. Be prepared to think laterally, your career path might not be straightforward. For example, say you love fishing. You mightn’t be able to picture yourself away from your family for months at a time on a tuna boat. But you might be able to start a fishing charter business. Fear of the unknown can be an impediment to making a change. Your normal job means a steady pay cheque, tasks you’re familiar with, and (usually) set hours you can build your lifestyle around. Giving that up can seem reckless, especially if you’ve got dependants. You’ve also got to consider your relationships; the people who depend on you for your time, as well as your income. The key to getting over this is to apply some principles of risk management. For example you’d start any venture with a lot of research and a solid business plan. You might go part-time while you get started up, just to keep the cash coming in. 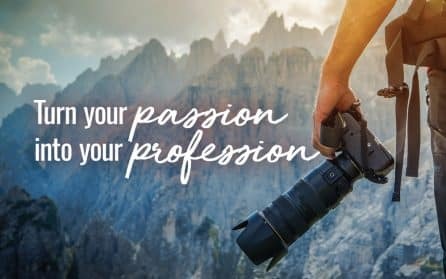 Think about how you can earn an income from your passion. List more than one job or business idea that centres on your passion. This way you won’t feel like you’ve only got one chance to pursue your pastime professionally. Look for inspirational stories on people who’ve gone where you want to be. Speak to people who’ve taken a leap of faith. Learn from their successes and their mistakes. Do your research – market research, professional development, education, etc. Make a plan for managing on a (temporarily, at least) lower income. Revisit your long-term financial plan.